Runner Erison Hurtault ’07 led Dominica’s delegation on July 27 in the opening ceremony of the London 2012 Olympic Games. PHOTO: CHRISTOPHE SIMON/AFP/GETTYIMAGESSeven Columbia alumni, two students and two coaches represented the United States, Croatia, Dominica and Egypt in the 2012 Olympic Games in London. New coaches on the Lions’ staff for 2012–13. Home football games this season (out of 10 games overall). Ivy League championships represented in the Hall of Fame Class of 2012 (includes individual and team titles). Three-time Olympian Caryn Davies ’13L, a member of the crew team that won a silver medal in 2004 and a gold medal in 2008, added another gold medal to her collection as part of the U.S. women’s eight that crossed the finish line in 6:10.59, more than a second ahead of runner-up Canada. The U.S. women are five-time world champions. Erison Hurtault ’07 was the flag-bearer for his father’s native country, Dominica, in the opening ceremony. He competed in the 400 meters, and although he ran a season-best 46.05 seconds in the last qualifying heat, it was not fast enough for him to advance to the semifinals. He also ran for Dominica in the 2008 Olympics in Beijing. Lisa Stublic ’06 represented her father’s native country, Croatia, in the women’s marathon. She was just one second behind the leader at the halfway point before fading to finish 52nd out of 118 competitors with a time of 2:34.03. Nzingha Prescod ’15, Nicole Ross ’11, James Williams ’07, ’09 GSAS and Jeff Spear ’10 competed for the U.S. fencing team. The women’s foil team with Prescod and Ross placed sixth and the men’s sabre team with Williams and Spear came in eighth. Meanwhile, Sherif Farrag ’09 competed for Egypt, where he was born, in men’s foil. The Egyptian squad lost to host Great Britain in the round of 16. Nick LaCava ’09 rowed with the men’s lightweight four, which placed second in the B final behind France. LaCava’s boat won the repechage in 6:00.86 but was eliminated from medal contention when it finished fifth in the semifinals. Michael Aufrichtig, Columbia’s head fencing coach, coached the fencing portion of the men’s modern pentathlon, which also includes horseback riding, swimming, shooting and running. And Caroline Nichols, an assistant field hockey coach, competed on the U.S. women’s field hockey team that placed 12th. Finally, David Barry ’87 was the Greco-Roman Team Leader for USA Wrestling. Barry, who recently was named USA Wrestling’s Myron Roderick Man of the Year, has been the Greco-Roman Team Leader since 2009. The U.S. team did not win a medal. The Campbell Sports Center, which Columbia Athletics is hailing as “the cornerstone of a revitalized Baker Athletics Complex,” will be dedicated on Saturday, October 20, prior to the Homecoming football game against Dartmouth. All Homecoming attendees are invited to attend the ceremony, which will begin at 11:30 a.m. The center, at 218th Street and Broadway, will serve as a year-round hub at Baker for student-athletes, coaches, staff and administrators. It’s Columbia’s first new athletics building since the Marcellus Hartley Dodge Physical Fitness Center was built in the mid-1970s. The center honors, and was made possible by, William V. Campbell ’62, ’64 TC, chair of the University trustees and captain of the 1961 Ivy League champion football team. The Campbell Sports Center will provide student-athletes and coaches with a state-of-the-art facility featuring a theatre-style meeting room, conference rooms, a strength-and-conditioning center, a student-athlete lounge and study center, a hospitality pavilion and coaches’ offices. New England Patriots chairman Robert K. Kraft ’63, distance runner Caroline Bierbaum LeFrak ’06, the late basketball coach Jack Rohan ’53, ’57 TC and the 1933 football team that won the Rose Bowl headline the Class of 2012 that will be inducted to the Columbia University Athletics Hall of Fame. The induction ceremony will occur in Low Library on Thursday, October 18. This is the fourth class to be inducted to the Hall of Fame. Other members of the Class of 2012 include former major league pitcher Frank Seminara ’89, College Football Hall of Famers William Morley (Class of 1902) and Harold Weekes (Class of 1903), the 1988 NCAA champion men’s fencing team, four-time All-American fencer Emma Baratta ’06 and eight-time Ivy League 400-meter champion Erison Hurtault ’07, who ran for Dominica in the 2008 and 2012 Olympics. The Hall of Fame Class of 2012 consists of 14 men, eight women and two teams representing 10 sports as well as an administrator and an alumnus (Kraft) being honored in a special category for individual achievement. Nominees were eligible from both the Heritage Era, spanning 1852–1957, and the Modern Era, 1957–present. 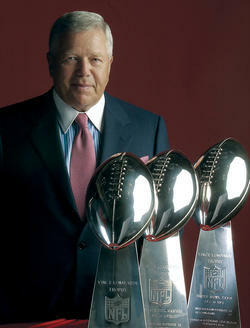 Robert K. Kraft ’63 with the Patriots’ three Super Bowl trophies. Kraft has turned the Patriots, whom he acquired in 1994, into one of the model franchises in all of professional sports, winning three Super Bowls along the way. LeFrak was a five-time All-American in cross-country and track and field in the mid-2000s. 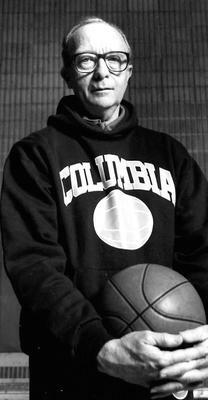 Rohan served two stints as men’s basketball coach, ranks as Columbia’s winningest basketball coach and led the Lions to the Ivy League championship in 1968. The 1933 Columbia football team was 6–1 during the regular season, losing only to Princeton, then defeated Stanford 7–0 in the Rose Bowl on a rainy January 1, 1934. Al Barabas ’36 scored the game’s only touchdown on a 17-yard run in the second quarter, taking a handoff from Cliff Montgomery ’34 on a misdirection play called KF-79. Intercollegiate athletics at Columbia can be traced to the mid-1800s, with some records indicating that the first intercollegiate sporting event in which Columbia participated was a rowing race in 1852. Tickets to the black-tie dinner and induction ceremony are available by calling Cathleen Clark, Athletics’ assistant director of development and alumni affairs: 212-851-9610.